Store and serve gelato like a pro. Displaying gelato beautifully is absolutely essential! Entice customers by showing your ice cream or gelato at its best. 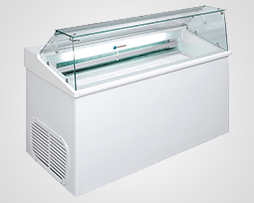 This ice cream scooping freezer is an attractive solution for displaying ice cream or gelato products. Designed for commercial use, it is ideal for gelaterias, cafes, food outlets or restaurants as well as catering functions. This quality ice cream scooping freezer is imported from Italy – and when it comes to gelato – we all know Italians know gelato best! Durable and reliable, this freezer maintains a stable temperature to preserve the texture and flavour of your frozen desserts. Clear glass lets customers appreciate your gelato offering. This freezer has a 6 top display capacity, and also comes with ample storage for extra gelato pans for convenience. Get both the best protection and the best presentation for your gelato in one freezer!